A friend and I were out last weekend on a photoshoot. We started at Peace Arch Park and moved up through Surrey to the Port Mann area. Off in Birdland (108th Ave and 152 St.) we found Robin Park, right next to the construction of the new Port Mann bridge. 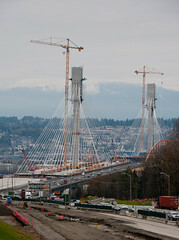 According to reports, the bridge is a bit more than half way done. We should see it open about this time next year, if we’re lucky. I use the term ‘lucky’ loosely. Right now the bridge is planned as a toll bridge. Anyway…we won’t get into tolling right now. We took some shots of the construction from Robin Park and then moved downhill to the banks of the Fraser River. Unfortunately, with all the cloud that day, looking up at the construction was not all that appealing in terms of photos. Perhaps on a sunny day. So, there you have it. Another milestone in transportation.